The recent public meeting showcasing Navy training, testing and military exercises planned for the East Coast, including Narragansett Bay, offered access to Navy scientists and mountains of data, but attendees were frustrated by the format of the gathering and by the ethical and environmental issues raised by next year's war games. Many visitors anticipated an open forum, where audience members ask questions and voice opinions on the planned military drills. Instead of a town hall-like gathering, the meeting was akin to an art exhibit or open house, where visitors had one-on-one conversations with experts in sonar, undersea warfare and explosives. The science-fair setting is common for controversial projects and was used recently for the proposed LNG facility expansion on Allens Avenue and other natural-gas pipeline projects. Jolie Diane drove from New Jersey with two friends to speak out against what she considers an extension of the 1992 United Nations Agenda 21 sustainable planning resolution. Like McIntoch, she praised a Rhode Island for introducing a bill that would regulate geoengineering. “Who’s going to be responsible for the damage?” Diane asked. 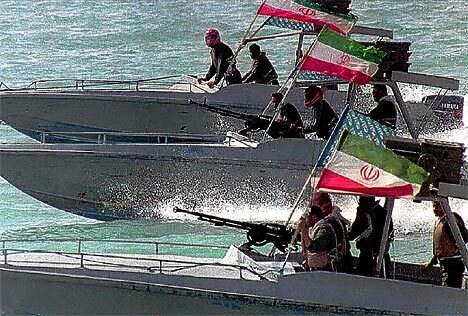 Iranian Navy on the move. Despite unanswered questions, the July 19 open house clarified the size and scope of the planned military activities. First, there won’t be a large-scale coordinated mock battle happening all at once up and down the East Coast. Rather, the activities will be a continuation of training and testing exercises that are already taking place. The Navy, however, must renew its environmental permit every five years in order to continue coastal military activities. Information sessions are held to take comment on the environmental impact statement. Comments can be submitted online through Aug. 29. If approved, the new five-year permit allows training activities to begin in late 2018. Most of the training and testing are modest-size drills that take place far from public view, according to the Navy. Cities with substantial Navy bases, such as Norfolk, Va., and Jacksonville, Fla., will likely host large air and sea demonstrations lead by an aircraft carrier and three smaller ships. Southern New England will host significantly smaller activities, most of which are already happening throughout the year. Rhode Island will have testing and training in two locations in Narragansett Bay and a third between Block Island and the mainland. The smallest of the three sites is directly in front of the Naval War College in Newport, a site of regular military training and testing because it hosts the Naval Undersea Warfare Center, a facility that designs and tests equipment and weapons to combat underwater threats. There will be no live ammunition used in Rhode Island. However, undersea sonar testing is the primary activity at these sites. Much of the center’s activity involves undersea drones that use sonar to map the seafloor and search for enemy vessels. Both low-frequency and high-frequency sonar will be used. The simulated combat activities also include the use of low-level seismic air guns. Navy experts at the recent open house didn't know the scope of the air-gun activity. The Navy insists that it is using the latest research from universities and the National Marine Fisheries Services to limit and monitor the impact on sea life. Data on the seasonal presence and migration of the endangered North Atlantic right whales, dolphins and seals will also limit the use of undersea testing, according to the Navy. Spotters will monitor the site for the presence of marine mammals and suspend operations if they are found. The Natural Resources Defense Council (NRDC) has been a frequent critic of the Navy's use of sonar, because of the damage it can inflict on sea life. The NRDC has also accused the Marine Fisheries Service for its permissive attitude toward sonar use.